Butternut grows best on stream banks and on well-drained soils. 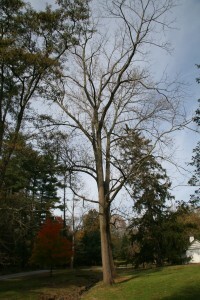 It is not a common tree in any area but is a fast-growing species on favorable sites. However, the tree rarely attains more than 100 feet in height and often divides 20 to 30 feet from the ground into stout limbs that form the wide-spreading, round-topped crown typical of open grown trees, The wood is light and soft but not strong. It is most often used for interior finishes and furniture. Butternut leaves are deciduous, alternate, and pinnately compound. Each leaf is 15 to 20 inches long with 11 to 17 oblong, fine-toothed, pointed leaflets, each 2 to 3 inches long.